A few diagrams and renderings for the project's three segments. Here are the slides from the public presentation about the plan. They include more details about some of the intersections and how they'd be handled. The presentation materials from last Tuesday's meeting at the Howe Branch of the Albany Public Library are embedded above, along with a few selected diagrams and renderings -- click or scroll all the way up. The city and Creighton Manning -- the engineering firm that's assisting the city on the design -- have broken the project into three segments, and each will be handled a bit differently. 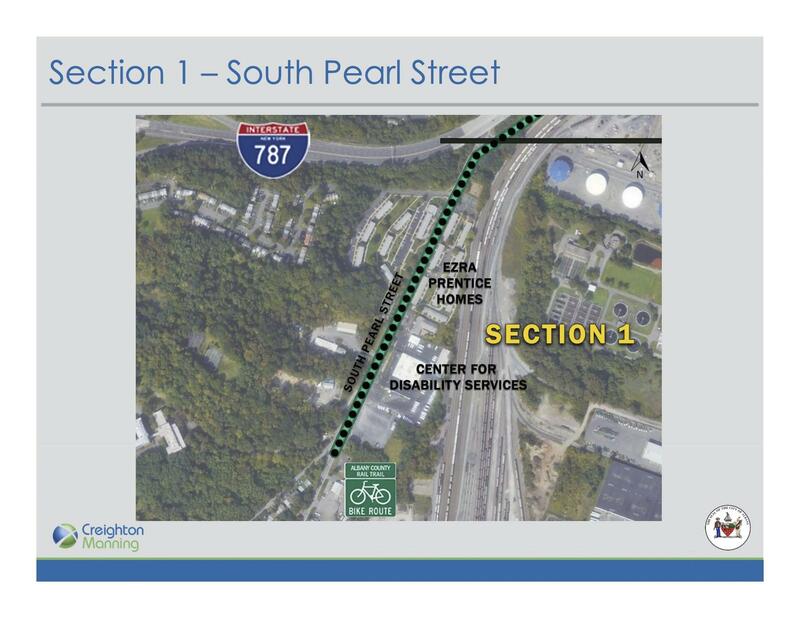 The first segment will include a two-way bike lane along the east side of South Pearl Street from the Helderberg-Hudson trailhead to just about the point where I-787 crosses over Pearl. 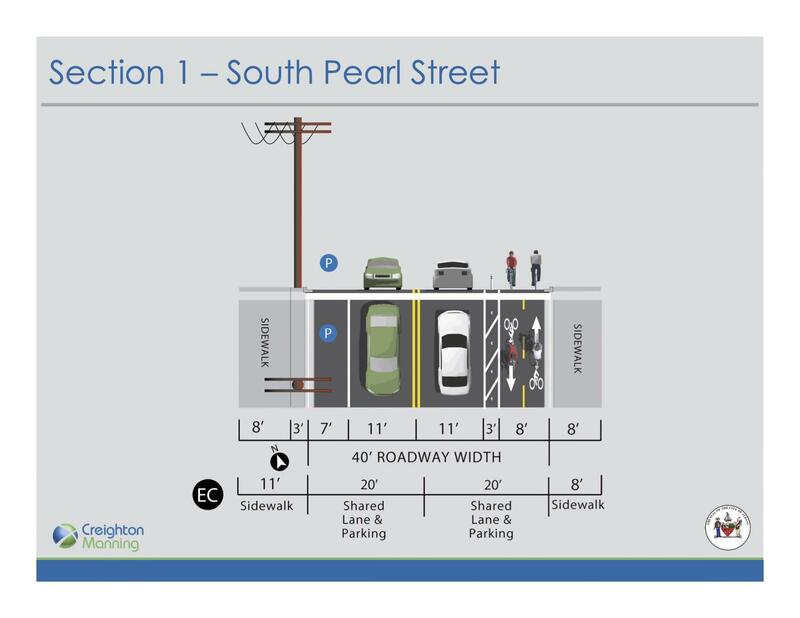 Parking along the east side of South Pearl would be removed to make space for the bike lane. This stretch of Pearl Street includes the Ezra Prentice Homes, and for years residents have been calling attention to speeding and heavy truck traffic on this portion. It's the section where a driver fatally struck 7-year-old Qazir Sutherland as he crossed the street in 2013. Spencer said one of the benefits of the bike lane should be calmer traffic. "That effectively narrows down the road width, which we think has a direct correlation in terms of traffic speed," he said last Thursday in his office. "So, when we talk a lot about traffic we talk about two things: one is the posted speed and then the other is the design speed. And when the two don't match you end up with people going way too fast. So we think that will help address that problem." 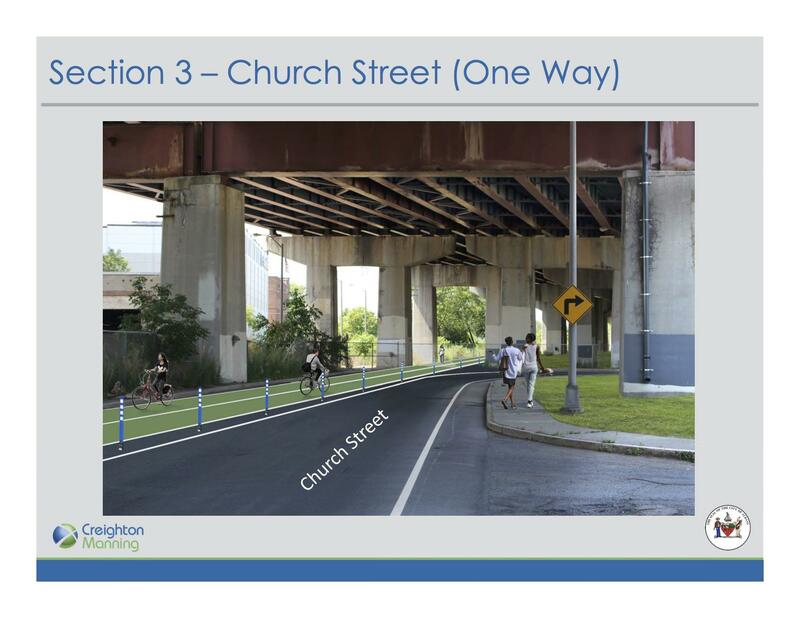 The design for this portion of the project got some pushback at the public meeting last Tuesday from Tom McPheeters, who's the interim executive director of AVillage, an org that advocates for people in the South End. McPheeters argued that removing parking along the east side of the street would prompt more people to park on the west side and then have to walk back across the busy street. The end of the rail trail is also on the east side of Pearl Street and Chris Spencer said the design team chose to run the bike lane along that side in order to reduce the number of crossings involved with the new connector, a safety consideration. But talking to McPheeters this past Friday, he wasn't convinced. "I don't think anybody cared about people in the South End. This is all about the bike commuters," he said, adding that he believed many people in the immediate neighborhood didn't end up having their voices part of the conversation. "You go door-to-door and ask the people who are affected what they think. And they have not done that." McPheeters said AVillage is willing to coordinate with the Ezra Prentice tenants association and help the city do more outreach. "I'm mainly concerned about the safety issue," he said. "It'd be better to take away all the parking and eliminate the safety hazard." Spencer said the new street design should be safer not just for cyclists, but for pedestrians as well. "By eliminating the parking, what it does is it makes the pedestrian who is crossing much more visible because they're not coming out from between two parked cars or something like that," Spencer said. 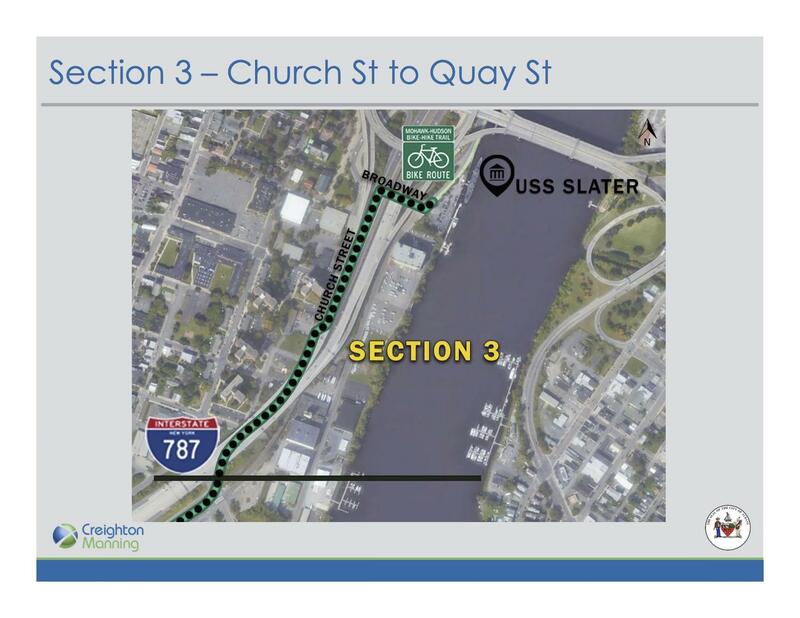 The second segment of the South End Connector is set to follow a frontage road alongside 787 from South Pearl Street to Church Street. The new patch would claim one lane of the two-lane road and separate it from the road with some sort of physical barrier -- either concrete "Jersey" barriers or a landscaped median. The city of Albany's Chris Spencer said the state Department of Transportation had some concerns originally about traffic potentially backing up at Church Street because of the vehicle lane reduction. But he said Creighton Manning studied it, and there's capacity in the new configuration to handle the traffic. 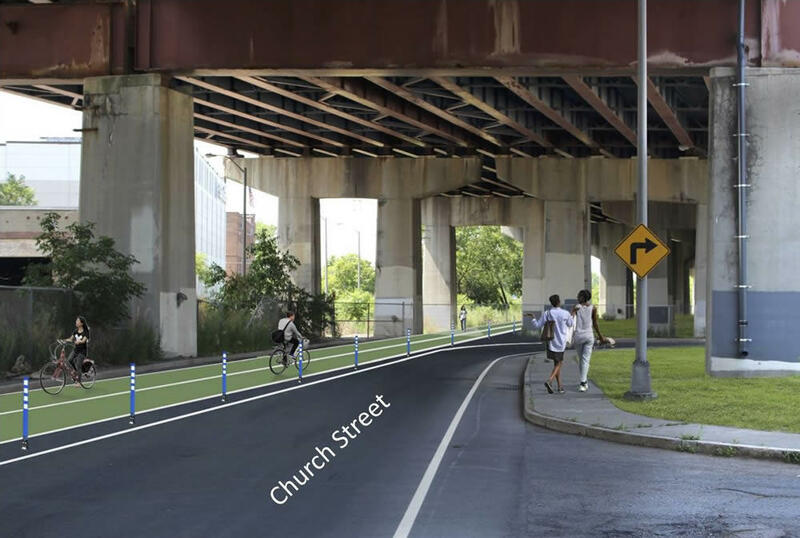 By the way: This segment of the connector (and potentially the South Pearl segment) would be the first protected bike lane in the city of Albany. 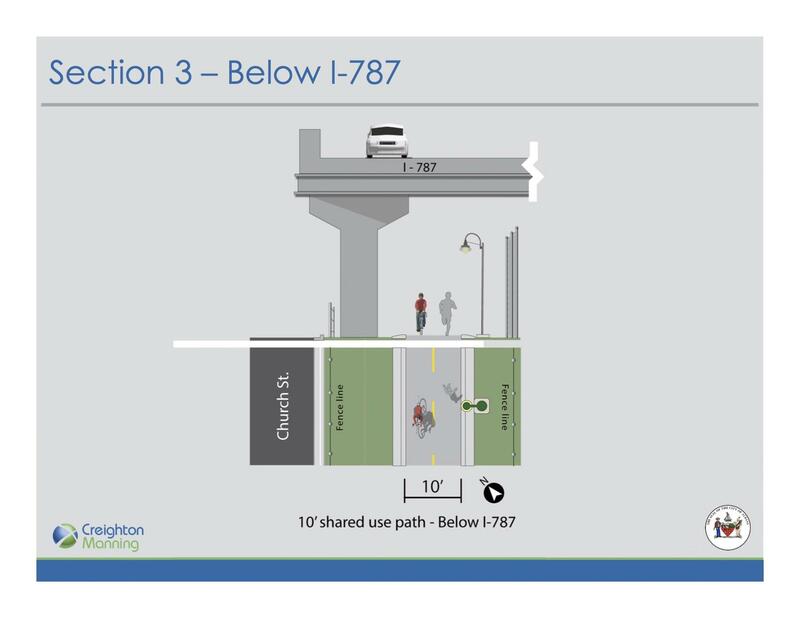 The third segment of the connector will run a multi-use path through space under an elevated portion of 787. There's a potential pinch point for the path near Church Street, and Chris Spencer said the project team is studying whether making Church Street one-way there would create room for the path. The area under 787 is potentially interesting space with a lot of possibilities for lighting or art or activities (other cites are doing something similar). Spencer said the city will be building a basic version of the path with an eye toward making upgrades in the future. "Our goal is to get the path constructed first and then we can make those enhancements at a later date as we secure additional funding," he said. The total cost of the South End Connector is roughly $1.5 million, according to Spencer, and the city is covering that with a mix of state grants. He said the city is in line for another $300k in state money, and that would go to making the upgrades on this "underline" segment. When's this going to happen? Spencer said the city will be nailing down the final design details for the South End Connector this winter. Then construction is set to begin in the spring. The whole length of the pathway should be open by the end of fall 2019. And upgrades will follow after that. "What we didn't want to do on all this was get too far ahead of what our funding would be and have grandiose ideas or routes that required property acquisition, right of way issues, dealing with railroads, things like that -- which could turn this into a 10-year project," Spencer said. "So we wanted to something that was doable and that we could deliver on, and I think that's what we're doing." We've played this tune a few times before, but it's worth spinning again: A bike path is good. But a network of bike paths is better. And that network could be more valuable than the sum of its individual parts because it opens opportunities for safer transportation, recreation, and commuting. So the South End Connector is an important project because it forms a link between the region's two most popular bike/walk trails. And -- with the planned Albany-Hudson Electric Trail and possibly a bike/pedestrian component for the next Livingston Ave Bridge -- downtown Albany is shaping up to be an important node in a much greater network of trails for both this region and the state. It also provides a glimpse of how a network within the city could be a benefit, especially for residents who don't have a car or prefer not to use one. "Anytime you improve the transportation network, whether it's bicycles or the [bus rapid transit/BusPlus] or the transit stops in general I think you're providing people of limited means, and may not necessarily have the means for cars, better access to jobs," said Chris Spencer, pointing to how the South End Connector could make it easier to travel from the neighborhood to jobs downtown and in the Warehouse District. Thank you so much!! This is going to be great!! Thanks for sharing this! 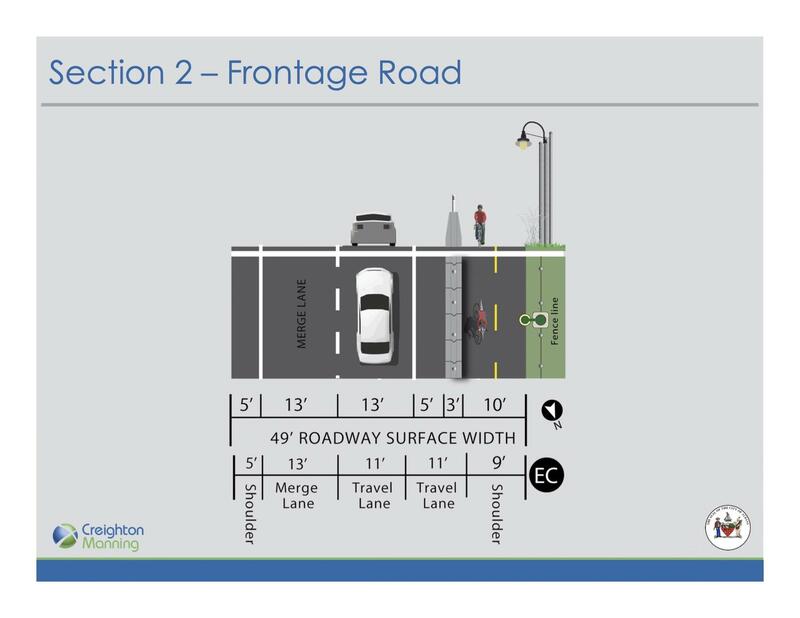 The road diet in the South End will make a huge difference in terms of safety. It won't slow everyone, but it will slow most users. Bring it on! Glad to see this update. Personally, I was for the Green Street Bike Boulevard for Section 3. It just seemed like the more socially responsible option. I also don't understand how the feasibility report claims that the 787 underline option would cost the same as Green Street when you consider the underline requires new lighting, asphalt, fencing, plowing in the winter...If you look closely at the cost estimate in Appendix A-29, there is no line item for lighting on the frontage road or underline section....But anyway, my opinion is there's a lot of streets in Albany to utilize and improve - so why build a new one?? Looks good to me. The worst part about about section 1 right now is that they place "sop for pedestrians" signs on the double yellow line at crosswalks. Before the signs, cars could swerve over the line to give bicyclists more room when passing. With those signs there, motorists try to thread-the-needle and squeeze between the signs and the cyclist. It can get pretty scary. This redesign will prevent that situation and make it more pleasant for motorists, cyclists, and pedestrians. I really respect Mr, McPheeters, but his perception of the outreach effort is simply incorrect. The City and design team spent months working with the residents of the Ezra Prentice homes, soliciting feedback, notifying them of meetings. and encouraging them to weigh in on alternatives - some of the alternatives proposed were tossed out specifically because resident concerns. Second, Mr. Spencer is spot on about the improvements and their traffic calming benefits. It is indeed a tragedy a child lost his life on this road, but now the city and DOT continue to be eager to make substantive change - and yes, that's driven in part but the bike and pedestrian improvements. This is, afterall, the second round of modifications to this road (following striping, signs, a midblock crossing and lower speed limit) Don't forget these improvements also connect the residents to both the Corning Preserve and the County bike Trail - two facilities they were previously isolated from because of the lack of bike and pedestrian facilities. Finally, options are extremely limited in this area because of land ownership and physical constraints. The consultant team explored several alternative options but each had significant drawbacks - one route would have been mere feet from the back doors of these apartments. What the city is doing is taking a road that was a thoroughfare for cars and making is a road that is capable of serving everyone - whether they use transit, bike, or they walk and we ALL walk. Saying that "This is all about the bike commuters" is pardon me, but ridiculous. There's an enormous, dangerous gap in the transportation and recreational network here - and documented safety issues. Closing that gap while at the same time improving the safety on this road serves EVERYONE. Anybody know if there are plans to connect the Hudson and Mowhawk sections of the rail trail, or to connect out to Troy? Broadway and the Green Island Bridge always feel a little dicey, especially with bridge construction. Same with getting over over 787. But I didn't realize how close to the Pig Pit is to those connecting roads. I may have to finally stop over there and check things out. 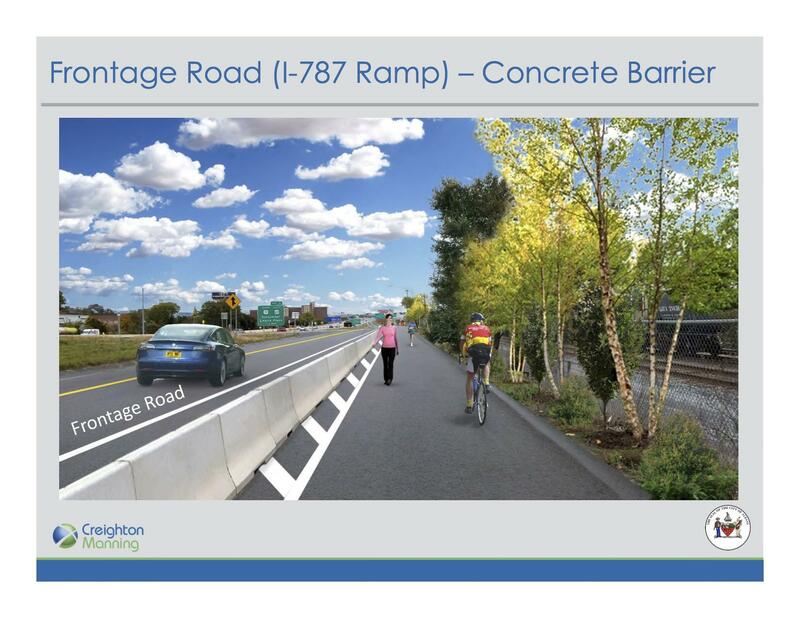 While I can see the case for routing the trail along Green St instead of underneath 787 as being more aesthetically pleasing and potentially cheaper to put in place/maintain, I think running it under 787 makes more sense. By running it under the highway, it is making good use of space that is going to be there regardless - like it or not, 787 isn't going anywhere anytime soon, so might as well make the most of it. Putting in lighting and streetscape enhancements will make the area more attractive, feel safer, and put a higher volume of people through there - which I feel would be a deterrent against that underpass area becoming the collecting ground for garbage it currently is. Also, the underpass segment is still close enough to Green street that everyone in that neighborhood can still benefit from it, while the current residents won't have to deal with sharing Green St with cyclists using the trail as a thoroughfare through the area. The key here will be the added maintenance - it's one thing to put it in when it's shiny and new and pat ourselves on the back, but all that is for naught if it's just forgotten about after day one and allowed to fall into disrepair after a few short years. There was a community task force established to make recommendations to the city and advocate for the best route. 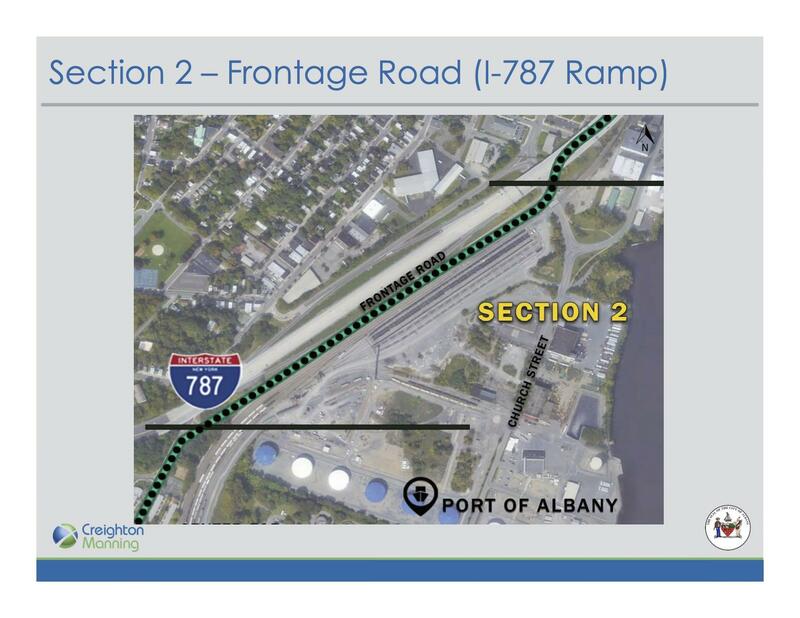 This administration deliberately took the path under 787 when it was recommended that the path be routed along lower Broadway nearer the Hudson River. There is no reason to have ignored the recommendations. All the property owners were on board. The was already a partial protected lane. And surveys by riders, runners, and other recreational traffic made it clear they would NOT be willing to go under 787. The behavior is reprehensible even if expected. Add a route along Broadway and stop making excuses. I often commute in from Delmar to downtown and will use this route. I too wish Green Street was selected as that is where people actually live and many could have used a Green Street route for daily transport needs and not just a ride to the park. There is a large housing development and a school on Green. There is a very large cycling population centered around the Albany City Mission just a block away from Green Street on Pearl. The decorative cobblestone intersections and the busy traffic, makes Pearl very hazardous for cycling. It would have been nice to give those cyclists an alternative. I made these comments during the study period. Apparently, there were higher priorities. 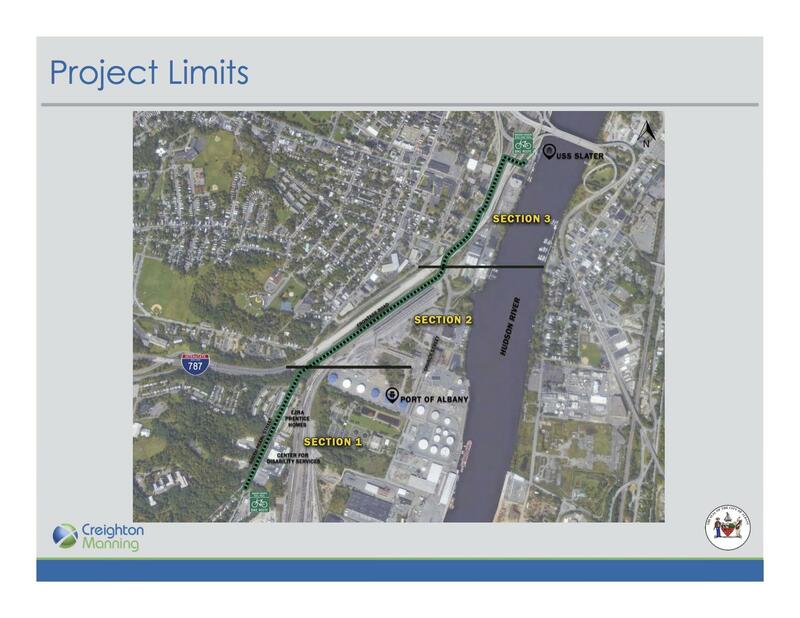 "The first segment will include a two-way bike lane along the east side of South Pearl Street from the Helderberg-Hudson trailhead to just about the point where I-787 crosses over Pearl." No part of this section of Pearl has the decorative cobblestone sections you mentioned - the closest one is much further north at Pearl & Second, so riders wouldn't have to worry about them. Do you happen to have access to the easements that would be needed from each and every property owner for the land needed for a protected bike lane? Especially critical is one from Uhaul where space is so tight the trail might have needed to wrap around the back of the building. To Mr. McPheeter's point, "I don't think anybody cared about people in the South End. 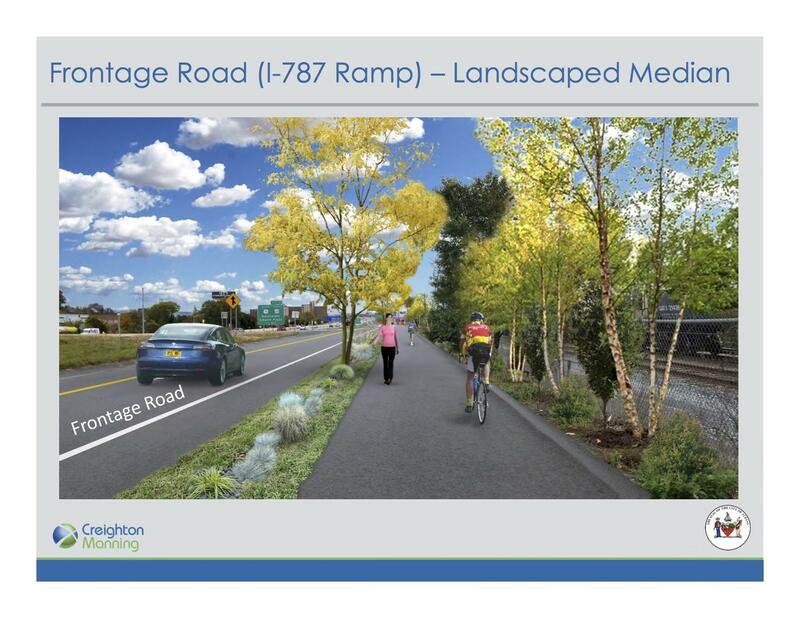 This is all about the bike commuters," the under 787 route was chosen in part balance the needs to residents who wanted access to the trail, and trail users that would otherwise not continue their trip if the route was on road, like it is now. It's a fact that when presented with an-on road trail with a rail crossing versus the separated bikeway, the trail users were unanimously in favor of the latter (I'm referring the boards on may 24th in which the under 797 was by far the preferred alternative - evidenced by survey results and the boards displayed at the public meetings where the ABC, Restore Our Waterfront, neighbors, concerned residents and trail users were asked to provide feedback. What alternative for an active rail crossing would you have proposed for the Broadway route? If you recall from countless meetings, NYSDOT was not supportive of the trail crossing the tracks - and for good reason, at grade rail crossings present unique challenges for cyclists and liabilities for the State. "The city has had its eye on spurring new development along Broadway and the riverfront in this section. But Spencer said the road currently has a number of pinch points and carries a lot of truck traffic. It will also probably be some time before there is anything like a boardwalk or something similar there, and he said the city wanted to move on the project now. But Spencer said if there's development along Broadway in the future, the multi-use path could be moved over there." - AOA, may 24th. Planing is balance. Many people commenting on the post want the route on Green St. Residents told the city they wanted access for the trail, and that they didn't want to be isolated from accessing it. Trail users told the city it should be off road as much as possible. The under 787 alternative is the best balancing act the city and it's team could develop. 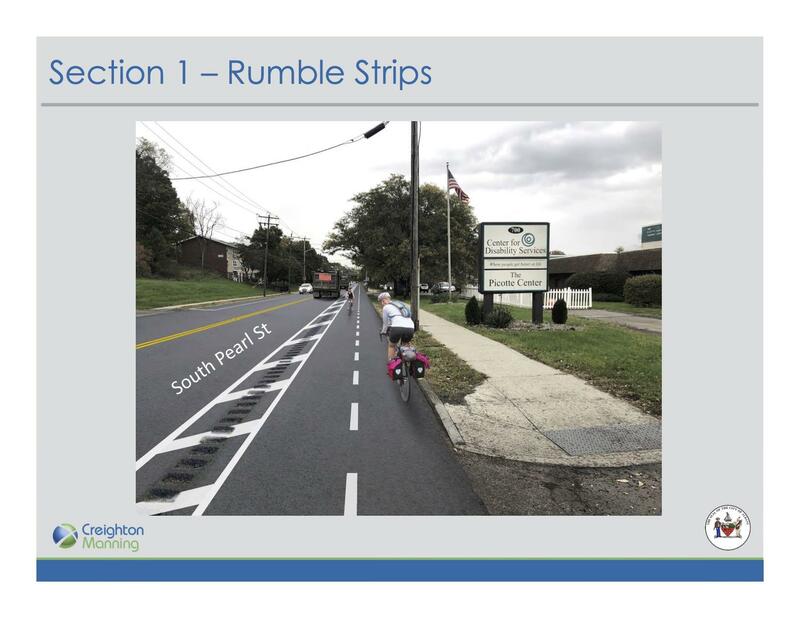 It also addresses blight, it's shovel ready, it does not need as much maintenance or plowing because it's partially covered and finally it doesn't preclude other routes being made possible by striping or sharrows for local use.